After explorations into a cappella and solo jazz through high school, machìna moved to Japan in pursuit of a lifetime in music. “I came to Japan with a pop song, actually.” Upon arrival, machìna was quickly scooped up by the bubbling pop scene. A former K-Pop star, a current model (Shiseido), and most certainly, an insatiable creative, machìna recounts her own self-discovery in creating a sound and style that was squarely her own despite the absence of a charted path by which she could find it. Starting off with drum machines and Ableton triggers, machìna went off to explore the history behind it… the roots of analog synthesis. “Moogs, buchlas… before there were keyboards, there were modular patches. 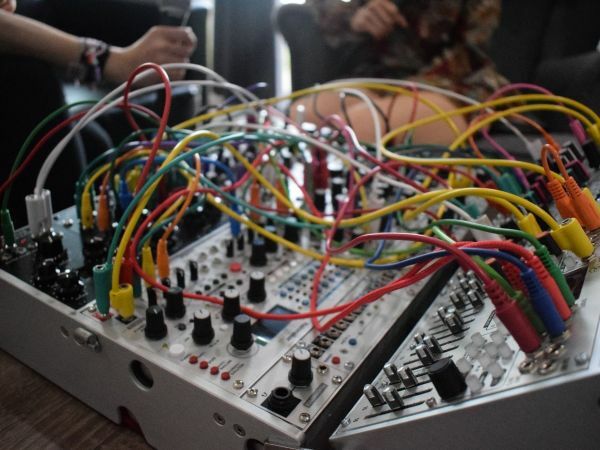 I thought this work was incredibly interesting, it was definitely the spark.” Modular synthesis provided a way to “create, capture, and share the feeling of the moment.” It tied in improvisation through a completely different stream of work. Scatting over gestural crunches and undulating polyrhythms, machìna created a patchwork of vocal brushstrokes amidst an atmosphere of rich electronic soundscapes. Machìna's work helps bring her closer to her own self-understanding: through each work, she further discovers her own voice & the stories she wants to tell, the ones that excite her. Incorporating traditional Pansori vocal techniques with noise-rooted analog articulations, machìna weaves her own distinct palette of creation from vestigal voices—tracing back to past, present, and future times, yet in introspective pursuit very much like that of her own. Today, machìna has fully committed to her own artistry—not only to being a musician, but to being herself and pursuing the expansion of her own creativity. Thoroughly excited by the fruitful landscape of modular synthesis, machìna seeks out further treks into her own improvisational lexicon through personal exploration and further collaboration. We’re so grateful that machìna found her own voice—blips and streams of tickling articulations, dancing in the centre of the heart. Purveying independence in art and in self-freedom, machìna heralds the sounds of Korea’s future in a unrestrained passion of experimental revolution. Lana Harris and Luke Martinez DJ/write/beyond for The Darker Side. The Darker Side has air every Saturday night 10pm-6am and Sunday night 10pm-5am.